lol, fill the thermos and get out the folding chair, lottery tickets are getting handed out at 7. I don't think I'll be able to resist if Star Fox has decent performance and Star Fox 2 is even more refined than the beta rom. My other big conflict is that the Eu/Jp version of the Snes looked a million times better than the horrible NA version but that's the one I played 24 hours straight when I get it for Christmas. Any chance a pre-order goes live today? lol I'm scared to go to lunch. haha I love these comments. People pay $60 for a single new release game, CAGs pay $48. The perception of pirates is priceless. Sorry, chief, but I'm not drooling over whatever Nintendo throws out at whatever price point they want to charge like a little lap dog. There will A LOT of salt when it's all over. So about them NES classics.... One of you HAS to have 1 at a reasonable price right?.... Right? If I can order one from Amazon, I may just order some salt to hopefully get it all sent in a box and not a bubble mailer! Interesting that there's Super FX Chip games on there. I'll probably try a lot harder to get one of these than I did the NES classic. Did nobody learn from the first time? The only glaring omission is Chrono. I would Photoshop the new box but don't have the time. Can't wait to flip one. Lol! Can't wait to never see this in a store. Same. I really, really hope they do actual preorders for this. I learned that I could make hundreds or thousands of dollars, if I wanted. I also learned that I could enjoy some of the best retro games with legitimate first party controllers and some sleek branded hardware. They should have also put in Super Street Fighter 2 instead of Turbo. Turtles in Time or even Final Fight would have been a great co-op brawler. They didn't put any in the set which is a big omission when shipping with 2 controllers. Now given the rarity and value that Nintendo has established through limited availability, I'm not foolish enough to believe the pre-orders this time around will last more than 5 minutes. Oh man, so many of my favorite games. Ff3, smw, eb, z3. But since all yall are going to be reselling this for ridiculous prices ill play on my phone. At least i finally got a switch recently. Oooooo boy here we go again. Hope I can snag one of these as this was the first video game system I ever owned. - Nintendo is slow to learn and adapt, but they MUST see now that there's a demand for this and increase production. ...right? RIGHT? - The Nintendo Online service is only confirmed to have NES games in its library. I'm sure that was a factor in killing the NES C early. The SNES C can comfortably exist alongside the online service, as it won't directly compete. - Original rumors said that Nintendo killed the NES Classic to focus on the SNES Classic so in theory they've been in production for some time. 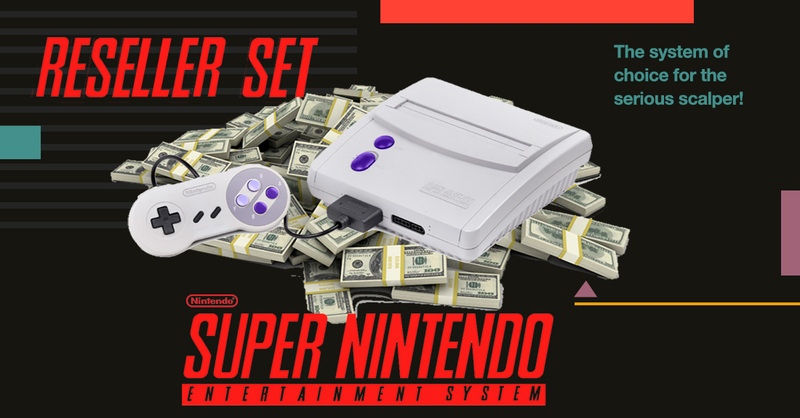 ALL THAT SAID, because everyone will expect this to be super limited, no matter how well the SNES Classic ends up being stocked it will be impossible to get for a while because scalpers will buy them all. I expect a big reason Nintendo is releasing this in September is so that the supply chain has a chance to even out before holiday shopping season. We'll see if that plan works for them. This is like a SNES greatest hits volume 1. Can't wait to get one. An Ebay listing is not news, nor is it interesting. When will people get over that? I could make a listing for pocket lint for a thousand dollars in one minute. WHO CARES! You must be new to Nintendo? You're naive optimism is cute and refreshing though. I do as well. I'd trade it without hesitation if I'm not able to secure one of these. I owned a SNES when they were new, if that means anything. I'm not a conspiracy theorist. "Planned scarcity" is nonsense. Nintendo likes money. They may do this as a small run for some weird reason, but plenty of signs point to this being better stocked than the NES Classic.